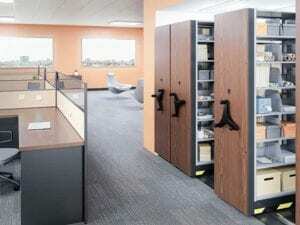 Mobile Shelving Solutions may be your ticket to getting more out of your existing space. One of the greatest challenges in business is managing growth. How can I get more out of existing space? It’s a question JB Office Matters customers ask all the time. And JB Office Matters has your answer. Mobile Shelving and High Density Mobile solutions are designed to squeeze the most out of available space and continue to grow as you need it. High density mobile can be configured in nearly any manner that might be required. Does your space management solution need a jump start? Investigating Mobile High Density Storage Solutions might just be your jumping off point. Mobile Shelving is movable, rides on tracks and can be manual or powered. They can start small and grow as more and more carriages are needed, they can be added. Once your initial investment is made, you can continue to leverage it. JB Office Matters is the greater Hudson Valley authority on High Density. Our team has decades of experience in properly designing and installing high density mobile shelving at businesses of all sizes. JB Office Matter is not just a solution provider, they are your partner in a more efficient and effective use of space when adopting these highly adaptable storage solutions.